The DDBSP Model Parameter Estimator allows automatic generation of constant or temperature dependent gE-model parameters from predictive methods. It is included in the DDBSP Mixture Prediction Add-On but can also be licensed as stand-alone software. The package includes the predictive methods and does not require the DDBSP Mixture Prediction Add-On. In most applications like e.g. 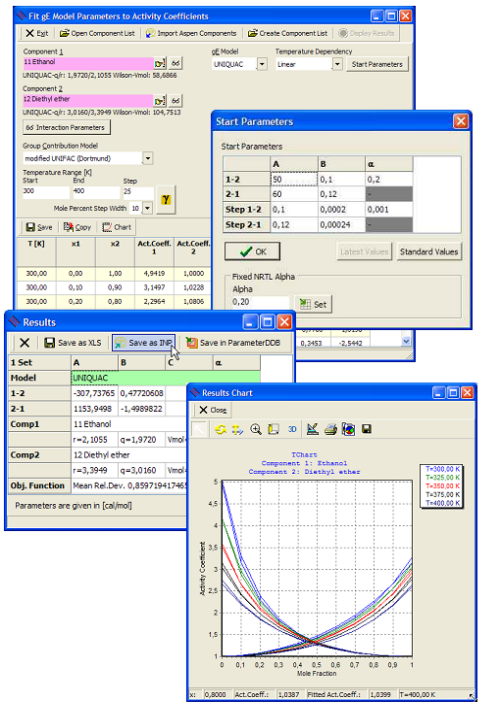 all major process simulation software, the interaction parameters are directly calculated from only a few estimated activity coefficients at infinite dilution. This procedure may in several cases result in very unreliable parameters. The DDBSP Model Parameter Estimator employs a more complex and safe approach for homogeneous and heterogeneous systems. For each binary combination a large number of activity coefficients is generated over a large concentration and temperature range and the binary interaction parameters for the Wilson, NRTL and UNIQUAC model are regressed to all values simultaneously. These parameters may be constant or linearly or quadratic dependent on temperature. The models UNIFAC, mod. UNIFAC (Dortmund), mod. UNIFAC (Lyngby), and ASOG are available for data estimation. COSMO-RS(Ol) and COSMO-SAC are available upon request. the latest published parameter matrices for the estimation methods. r, q and q’ values (UNIQUAC) for 11418 components. Members of the UNIFAC-Consortium have access to the latest UNIFAC and mod. UNIFAC parameters. Components can be selected from the DDB or directly imported from an Aspen Plus project. The software allows parameter generation for a large number of binary combinations in automated mode. Final parameters can be stored in the DDB parameter data bank ParamDB or exported as Aspen Plus inp-file.